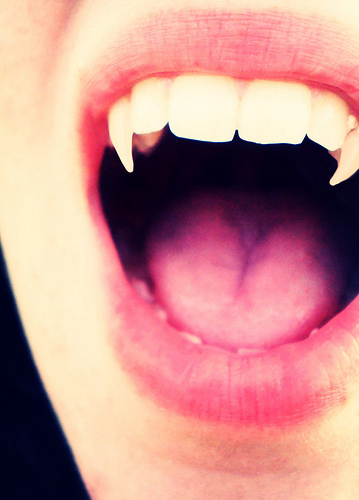 Beauty Costs > How Much Do Vampire Fang Implants Cost? How Much Do Vampire Fang Implants Cost? Usually, fang implants are for cosmetic purposes, and these implanted fangs are fitted over the original tooth; they can be movable but can also be permanent. Similar to the plastic ones you see during Halloween, some people spend the money to have the permanent fang look. This procedure is often catered to those who make unique body modifications. The cost will depend on the type you get and where you get it done. A synthetic removable type too can cost about $100 for each fang. To have a permanent set, cosmetic dentists, who perform the procedure, may charge $800 to $2,500 for two fangs, and this is done by filing the teeth down and placing a permanent cap over your tooth. The most expensive process, which can involve custom made caps, can cost $2,000 to more than $5,000. These caps can be taken off and will look almost as good, if not better than a permanent solution. Cheaper fake vampire teeth, designed primarily for Halloween costumes, can cost less than $10. Dr. Rob Tennet said it will depend on your bite and which type you’re thinking about fangs in the corner or in the middle. There are few ways you can get vampire fangs: via a slip on, permanently or caps. The most common type will be a slip on. As the name notes, these fangs simply slip over your teeth and you’re able to take them out whenever you please. Permanent options, on the other hand, will be made from real dental acrylics. These teeth will be inserted via a cosmetic dentist and will be adjusted to fit your mouth via a drill. During this process, your tooth will be filled down enough so the cap can fit on. Lastly, caps can be either be made from a synthetic material, or it’s customized, it could be made from an acrylic-like material that’s used to fill cavities. Caps won’t be permanent, as mentioned above. Implants can come in just about any size; however, experts warn if they are too large, it may interfere with your speech. The procedure can be done at various cosmetic dentist offices, but do keep in mind many will condone the process and may not agree to it. Vampire teeth are for appearance purposes only, and usually, these teeth won’t be sharp enough to puncture the skin. Since this is considered a cosmetic procedure, most insurance providers won’t cover something such as this. Those who are a viable candidate will have healthy teeth and a significant amount of bone in the jaw. Those who have any gum disease or rotting teeth will often have a hard time finding a dentist who will perform the procedure. Those who have had the procedure done in the past say it can be hard to eat and talk at first; however, as time goes on, you will get adjusted to it. Side effects may include developing malocclusion, which is overjet of the upper front teeth. Sores may also pop up in the area where the fangs were implanted. If getting permanent fangs, don’t forget about the future as you grow old. Many dentists and cosmetic surgeons will give a discount to cash patients. Consider other options such as slip-on teeth. These teeth can be temporary and are only going to cost significantly less than actual implants. If you can’t afford the bill up front, some dentists may allow you to get on a payment plan.